Tracking inventory at the variant or option level is sometimes needed. This feature is useful for tracking quantities in stock of size and color variations where just a single count of in stock at the product level is not sufficient. Naturally, there is additional upkeep involved with variant inventory and the amount of upkeep grows with the addition of each variant type you have on a product that you wish to track inventory on. For example, size and color is pretty easy, however tracking inventory on size, color, style, hem and weave variations becomes much more challenging. The good news is both are possible with a AmeriCommerce online store. Variant inventory can be enabled at the product level on the Variant Inventory tab of the product editor. 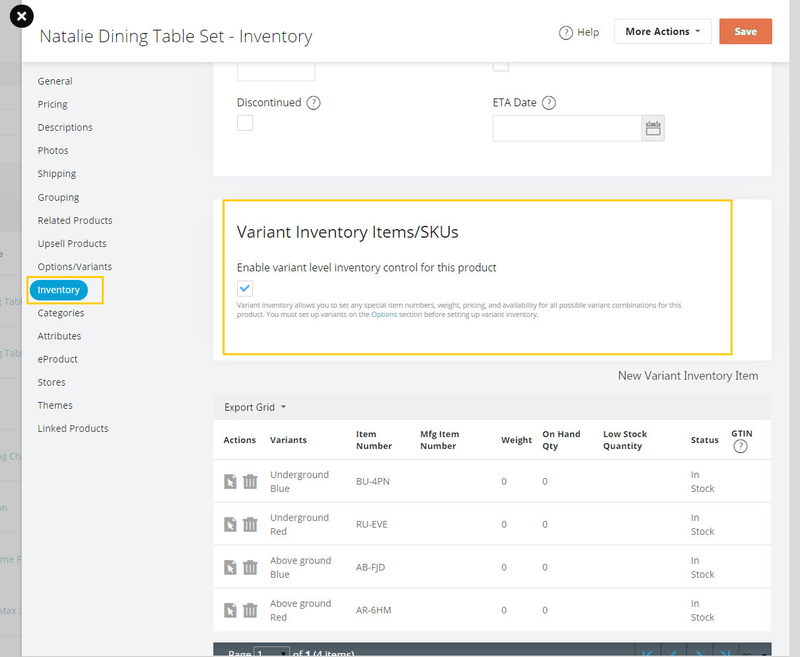 Before enabling variant inventory, make sure the product's variants are already set up on the Variant/Custom tab. Each combination of variants is automatically generated from the options on the product. Note that any non-inventory variant groups will not be included, this allows you to have options that are not tracked by inventory and is very useful. Each combination is treated like a separate unique item, so the remaining settings will all override that setting from the base product. Item Number - Override the base product's item number if this combination has a special item number/SKU. Mfr Item Number - Override the base product's manufacturer part number. Weight - Override the base product's weight. # In Stock - The number in stock of this variant combination. When variant inventory is enabled, the base product's Quantity in Stock field becomes read only and will display a sum of all variant inventory items' stock counts. Status - The product status of this variant inventory item. These are configurable via the Product Statuses settings page. Variant inventory items can be assigned a specific price using the Advanced Pricing tab. Variant inventory items can be edited en masse using the Product Variant Inventory Import located at Tools > Data Import > Product Variant Inventory Import). 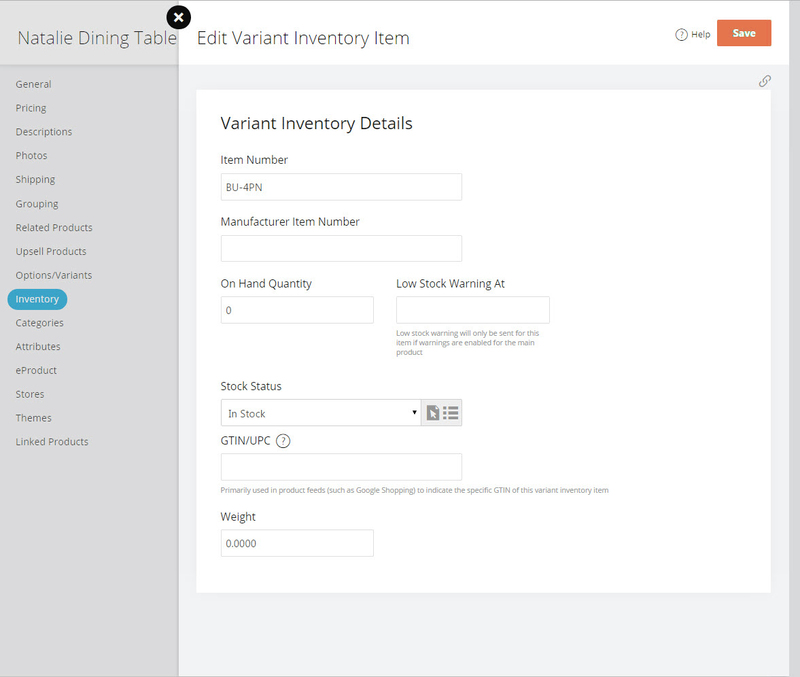 The Inventory Editor (Catalog > Product > Edit selected product) also allows the updating of variant inventory stock counts. Note: Inventory is managed when a status is changed or the payment is received, depending on how it is configured. If your store is set to remove inventory when the order is paid, any changes made to the order after the payment is applied will not update inventory. In this specific situation you would need to increase or decrease the stock for them manually. Is it rare for you to have to update the variants after the order is paid?